Representative Bob Michel, the House Republican Leader from 1981 to 1995, died early today. In addition to his life-long service to the country, Michel was one of the driving forces behind the creation of the Congressional Institute. 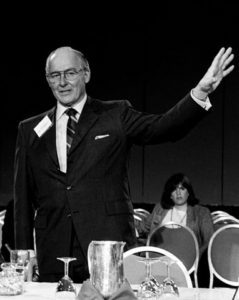 We mourn his death and pray that his spirit of civility and dedication to public service finds a rebirth in Congress, the institution he was passionately devoted to. Below is a tribute written by his long-time friend and chief of staff, Michael S. Johnson, a co-founder of the Congressional Institute and former chairman of the Board of Directors. Robert Henry Michel, the longest-serving Republican Leader of the U.S. House of Representatives and recipient of the Medal of Freedom, the nation’s highest civilian honor, died early this morning, Friday, February 17. He was 93. Michel served as the top Republican in the House for 14 years, during a transformative era in American history. He led Republicans through the administrations of Presidents Ronald Reagan and George H.W. Bush and in the years preceding the transfer of power in Congress from Democratic to Republican for the first time in 40 years. Michel had a reputation as a skilled legislative craftsman, who knew his members, and who could achieve consensus among his colleagues, making him a vital and indispensible ally in the passage of the Reagan and Bush agendas in a Democratic-controlled House. He played a critical role in garnering majority votes for Republican budget resolutions, increased defense spending, landmark tax reform laws, trade legislation, criminal justice, reform of Social Security, the Gramm-Latta budget reforms, spending reductions, congressional sanction of the Persian Gulf War, and other major legislative initiatives. Michel orchestrated the talents of a leadership team that included three future Cabinet secretaries, a Vice President, and a future Majority Leader of the U.S. Senate. While loyal to Presidents Reagan and Bush, Michel was considered a man of the House, who did not hesitate to defend the Legislative Branch when he believed its constitutional prerogatives were being usurped by the Executive. The hallmark of his tenure was his deep respect for Congress as an institution of government, his respect for his colleagues, and the practice of civility in the deliberation of public policy. He was a consummate legislator and consensus builder who believed that regardless of your political ideology or partisan agenda, you had to build bridges to be successful. Michel was known as a straight shooter whose word was as good as gold, and his firm handshake a guarantee of good faith. He was a powerful advocate for his Peoria-based district, particularly through his long tenure on the House Appropriations Committee. Michel served under six Speakers of the House and seven presidents, and as Republican Leader served as permanent chairman of three Republican national conventions. Michel was born in Peoria, IL., March 2, 1923, to Anna Baer Michel, who was born in Tremont, Utah, the child of German immigrants, and Charles Henry Michel, who emigrated here from Nancy, France. The elder Michel lived in Clearwater, Oklahoma, harvesting wheat, before moving to Peoria to work at Keystone Steel and Wire as a toolmaker, while his mother was a domestic in Peoria, IL. Both parents were active in the Apostolic Christian Church. The elder Michel insisted that his son work while being educated in Peoria public schools. He did, mowing yards, delivering papers and working in a tailor shop, factory and grocery store. Michel was graduated from Peoria High School, the president of his class, and attended one semester at Bradley University in Peoria, prior to joining the Army in World War II. Michel landed in Normandy on the fourth day of the D-Day invasion of Europe with the Thirty-Ninth Infantry Regiment and fought his away across France to Belgium and the Battle of the Bulge. He was wounded in action and credited with capturing a German machine-gun unit. He received two Bronze Stars, Purple Heart, and four battle stars. After the war, Michel re-enrolled at Bradley, where he was a member of Sigma Nu Fraternity. There he joined the a cappella choir, where he met his wife of 55 years, the late Corinne Woodruff. They married on December 26, 1948, the same year they were graduated from Bradley, she with a degree in music and he in business administration. Michel began a career in politics that spanned nearly 50 years, joining the congressional staff of then Congressman Harold Velde in 1949, as his administrative assistant. While Velde was consumed with his chairmanship of the House Un-American Activities Committee, Michel tended to the needs of the District, substituting for the Congressman at events and serving constituent needs. Upon Velde’s retirement in 1956, Michel prevailed in a hotly contested, four-man primary race and eventually defeated Democrat Fred Allen in the general election to take the seat from Illinois’s 18th Congressional District, a region of the state once represented by Abraham Lincoln and Everett McKinley Dirksen. Allen, 57 years after his defeat, made it to Washington to attend Michel’s 90th birthday celebration in 2013. Michel, had a conservative voting record in the House. He first served on the House Committee on Government Operations Committee and was appointed to a subcommittee chaired by the future House Speaker John McCormick of MA and ranking member, Bud Brown of Ohio, one of the most influential House Republicans of the era. Michel was named to the House Appropriations Committee, on which he served for 24 years, 12 of which as the senior Republican on the Labor, Health, Education and Welfare Subcommittee. He advanced in Republican leadership ranks, serving as chairman of the National Republican Congressional Committee (NRCC) from 1973 through 1974, and despite the loss of 42 seats in the 1974 Watergate midterm elections, he was elected Republican Whip in 1975, serving as the number two Republican in the House until 1981. He was elected the House Republican Leader following the 1980 elections that sent Ronald Reagan to the White House and gave the GOP 192 seats in the House and control of the U.S. Senate. Michel defeated Michigan Congressman and Chairman of the NRCC, Guy VanderJagt, for Leader in a close race dubbed the Workhorse (applied to Michel because of his legislative skills), versus the Showhorse , VanderJagt (a spellbinding orator). Michel was awarded the Medal of Freedom by President Bill Clinton in 1994. President Reagan conferred upon him the presidential Citizens Medal in 1989. He received the first Congressional Distinguished Service Award in 2000. Then President of France, Jacques Chirac, named Michel to the country’s most prestigious order, the Knights of the Legion of Honor in June 2004, during the 60th anniversary of the Normandy landing, “in recognition for your participation in the liberation of France and Europe during the Second World War.” Michel participated in ceremonies marking the anniversary in England and France, and was presented with his Legion of Honor award in September of that year by the French Ambassador to the United States, Jean-David Levitte. Michel received many honors and recognitions. Speaker Newt Gingrich named the leadership offices on the second floor of the United States Capitol, the Robert H. Michel Rooms. A bridge spanning the Illinois River is also named after him as is a Veterans’ clinic in Peoria, the student center at Bradley University and the cloakroom at the Capitol Hill Club in Washington. Michel was also named to the Roll Call Baseball Hall of Fame for his record as a winning pitcher in the annual Congressional Baseball Game sponsored by the newspaper. The Leader was a diehard fan of the Chicago Cubs and an avid golfer as well. He was a lover of music and an accomplished singer, often accompanied on the piano by his wife, Corinne. He performed the national anthem at the Republican National Convention in Houston, TX and was afforded the honor of conducting the Mormon Tabernacle Choir in Salt Lake City, Utah. Gardening was also among his most favored pastimes. Michel was preceded in death by his parents, a sister and his wife, Corinne. He is survived by a sister; four children, Scott, Chicago, Illinois; Bruce, San Antonio, Texas; Laurie, Alexandria, Virginia; and Robin, San Francisco, California; five grandchildren and two great-grandchildren.